Now you can also connect a wood burning heater to our Polar and TopSpa XS model ranges. 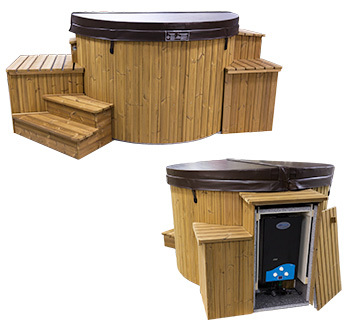 It's advantageous to have an additional energy source for faster heating if your hot tub is going to be used frequently and the water has to be changed often. Then our wood burning heater is a convenient option. Our Polar & Artic models are equipped with electric heating as standard and this cannot be opted out. It is an important part in the design that guarantees that the water is always of the right temperature as well as protecting against freezing damages. The additional heater must be placed inside a insulated box with an insulated cover (lid) when not in use. The code is LMCH.